Elaine Watson, a nail tech and educator based in Tarzana, Calif., describes her technique for French fabric tips. Open the door to new color, texture, and design options by offering clients fabric nails. Elaine Watson, a nail tech and educator based in Tarzana, Calif., describes her technique for French fabric tips. 1) Have the client pick out the fabric print of her choice. 2) Size her nails for clear tips. 3) Cut squares of fabric larger than the tips. 4) Using a thin viscosity resin, adhere the fabric to the top of the tip. 5) Trim the excess as well as you can. 6) Apply brush-on resin over the top of the entire tip (and any excess fabric). This hardens the material so you can file the excess on all sides. 7) Use an electric file to define the smile line, then refine it with a hand file. 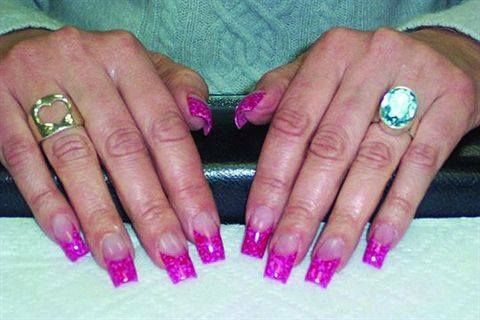 8) Prepare the client’s nails as you would for any enhancement service to her nails. 9) Dehydrate and prime the nail beds, then apply the tips to her nails. 10) Overlay the entire nail and tip with acrylic. You can use a clear or translucent shade. 11) File to finish as usual and buff to a high shine. The nails will last as long as they are maintained. “If the fabric is covering the entire nail, the regrowth area can be filled with a small strip of fabric just like a fiberglass or silk fill,” she says. “If it is done as a French, backfilling does pose a problem.” In that case, Watson recommends masking the smile line with nail art or polish as the nails grow out.